You may have already known from my past newsletters that cinnamon is one of the most powerful antioxidants that you may have been overlooking in this world where acai, goji berries , blueberries, and red wine are the only antioxidant sources that get major press. However, have you ever eaten curry? That yellow color in curry is attributed to a spice called Turmeric, and it is one of the most powerful antioxidants you can consume with amazing health benefits. Turmeric has been used in India for thousands of years as a dye, as a spice for dishes, and also in traditional Indian Ayurvedic medicine. Turmeric has some of the world’s most powerful fat-burning and healing qualities of any food or spice. It is a potent anti-oxidant, anti-inflammatory, and anti-bacterial substance. Turmeric grows as a shrub in India and tropical parts of Asia. The roots are ground up to make turmeric. Its main active ingredient is a substance called curcumin and it is bright yellow. This bright yellow spice has medicinal properties as well as adding its pungent color and taste to many delicious dishes. Ayurvedic medicine has used this spice as a whole body cleanser, an aid for digestion, and in treatments for fevers, infections, liver and gall bladder problems and arthritis. It may even help to burn fat, and is also very effective as a preventative for heart disease, and Alzheimer’s. The rich stores of antioxidants are very effective against the free radicals which contribute to premature aging, disease and cancer. Many natural practitioners actually recommend turmeric when a potent antioxidant is needed. Turmeric helps to digest fats by stimulating the flow of bile in the gall bladder and therefore is very effective as a digestive aid and fat-burning compound. Studies also show it is highly effective at reducing the inflammation from Irritable Bowel Syndrome, ulcerative colitis, and Crohn’s disease. For the heart, it contains strong anti-platelet substances which help prevent the blood from clotting too easily, and so is very effective against heart attacks and strokes. In addition, homocysteine, a chemical component in the body, which is one of the primary predictors of heart attacks, is significantly lowered in the presence of curcumin. 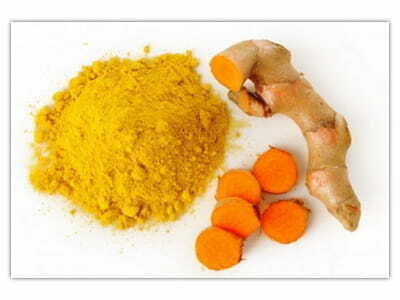 The curcumin in turmeric also has been shown to lower and reduce the oxidation of plaque on the artery walls. As an anti-inflammatory it has been used effectively for a treatment for all types of osteoarthritis, rheumatoid arthritis, and for joint pain. Turmeric is a powerful weapon against cancer cells as well. Studies show that this super spice can actually prevent cancer tumors from growing and in those who already have cancer, turmeric slows the growth and spread of cancer. In a research study done with mice injected with cancer cells, the curcumin in turmeric was proven to be more than twice as effective as the cancer drug paclitaxel (Taxol). The curcumin in turmeric is also highly effective when combined with the anti-oxidant quercetin (found in red onions, apples and cherries) against pre-cancerous polyps in the colon. Studies show that polyps were reduced by 60% and the average size of existing polyps were reduced by 50%. In addition, MD Anderson Cancer Center has been conducting studies for years now that have shown very powerful effects from curcumin in turmeric on halting cancer growth and cancer risk reduction. One of the most exciting new studies has shown turmeric’s value against Alzheimer’s. Studies of the Indian population who have a high intake of turmeric in their curry dishes show a very low incidence of Alzheimer’s and dementia in the elderly. Alzheimer’s victims have a buildup of a certain type of plaque in the brain and turmeric is highly effective at breaking down this plaque and protecting brain health. One way to get high concentrations of curcumin is to use the spice turmeric in some of your cooking and recipes. 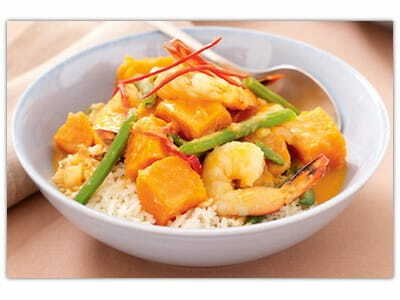 Curry contains turmeric, but is usually a combination of several spices and you may not get as much turmeric as you would using pure turmeric. That's not to say there aren't benefits to curry too, since it is a blend of several spices that are all proven to have powerful health benefits. Turmeric is very yellow and can stain so be careful when using it. This spice doesn’t have to be used just for curries. It is delicious on sautéed apples, or steamed cauliflower, green beans and onions , or any of your favorite veggies. Make sure to add butter or coconut oil to your dishes that contain turmeric as the fat is also important for turmeric absorption. Try turmeric mixed with your scrambled eggs in the morning too...this is one of my favorite ways to use it! Turmeric is also a great spice to complement recipes that feature lentils. Give salad dressings an orange-yellow hue and a little extra flavor by adding some turmeric powder to your salad dressings . Once you start using turmeric on a regular basis, it's fun to find new ways to use it in healthy recipes. Another one of my favorite ways to use it is to add a healthy dose of it to egg salad. It adds a great flavor, and gives the egg salad a delicious rich yellow hue. 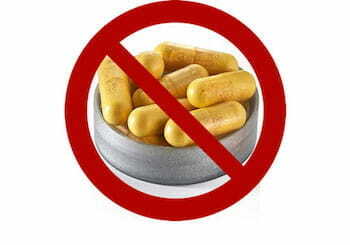 Most of the turmeric supplements you see in stores come in the form of encapsulated powders. The truth is with turmeric powder you might be getting very little actual benefit if you're not absorbing it properly. The reason is that turmeric powder has a fairly low bioavailability (meaning that a good portion of it isn’t properly absorbed by your body), it often isn’t very fresh, and it’s sometimes made with harsh processes that can destroy or degrade turmeric’s healthful components. Turmeric powder is ONLY absorbed if you eat it with fats. Also black pepper contains compounds that increases turmeric absorption dramatically. PuraTHRIVE Liposomal Organic Turmeric Extract is an outstanding full-spectrum extract that’s “liposomalized”—meaning it’s specifically blended to make the turmeric bind to phosphlipids (fats) that increase its bioavailability 10 to 20 times! It actually tastes surprisingly good too in this liquid dropper form! I like to take a few squirts per day dropped either right in my mouth, or in my iced tea. > Give this truly revolutionary powerful new form of turmeric a try … you won’t believe how quickly you feel its effects. Once you do, you’ll wonder why you didn’t make turmeric a part of your daily life a long time ago. Aggarwal B. Paper presented at the U.S. Defense Department's 'Era of Hope' Breast Cancer Research Program meeting in Philadelphia, PA, October 5, 2005,. reported in NUTRAingredients.com/Europe "Turmeric slows breast cancer spread in mice. ".